The Friday evening potluck is a standing tradition at BBQ contests in California. It’s a last chance for fellow competitors to relax and be friendly, catch up on how the family is doing, and swap funny stories before the teams put on their game faces and gear up for intense competition mode late Friday evening for the long overnight cook until turn-ins at noon Saturday. I’ve developed quite a following on the California contest circuit for my elaborate potluck dishes demonstrating culinary artistry cooking in a challenging outdoor kitchen setting (think blustering Santa Ana winds, summer heat, dust, bitter cold, etc.). I love the challenge and think this part is as fun as the actual BBQ contest. We often have different potluck themes such as coming up with a dish based on some classic movie. By day, I sit in a fabric-covered box leading a team of information technology project managers in a Dilbertesque existence. On weekends, I love to express myself artistically by making a simple white dinner plate come alive, like an empty artist canvas, with the freshest ingredients sensationally juxtaposed with balanced colors, presentation, texture, aromas, and taste. I’ve been inspired by foods from around the world in all the many beautiful countries I’ve traveled to as a former 747 pilot. I cook from the heart with passionate appreciation of the culture and cuisine I’m trying to emulate. I’ve received three marriage offers so far from those who’ve enjoyed them immensely! I’ve also released my Ahi Tuna pictures for a Hawaiian magazine publication and I also cater these fabulous dishes! They taste as good as they look. 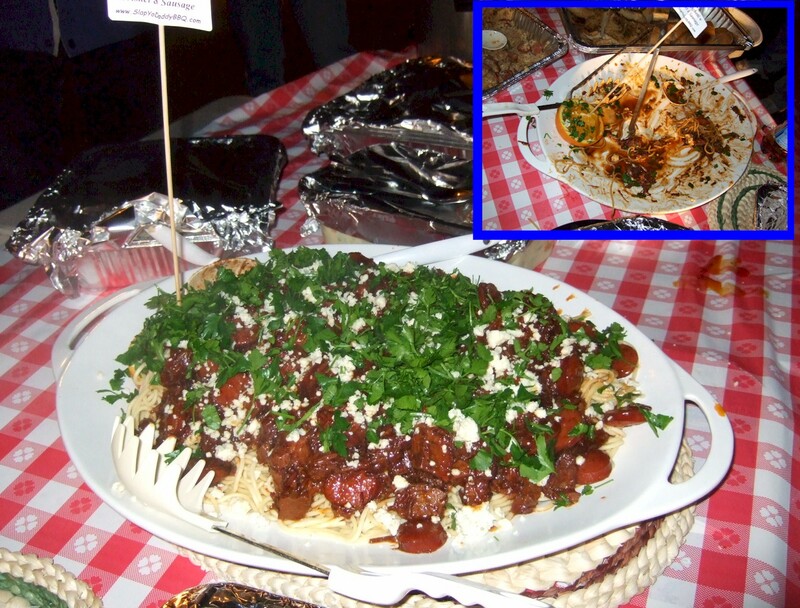 Enjoy these 17 contest potluck pictures! My son Brian shot video of me making the Jack Daniels Prawns dish. Many have asked what happens in my tent Friday nights so now here’s your chance to see it yourself! Enjoy! White Fish cut into paper-thin slices using the usu-zukuri method; arranged beautifully on a platter ala fugu blowfish plate-style; dabbed with a little grated young ginger; sprinkled with sesame seeds, chives, and yuzu soy sauce. Just prior to serving, heat olive oil and sesame oil until smoking and drizzle over fish slices. This dish always disappears FAST! RECOMMENDED FOR HESITANT SASHIMI NOVICES!! !